This post isn’t just a celebration of durability, steadfast endurance, and longevity. Those are all virtues we love, but in the case of tenor saxophonist Ted Brown, who turned ninety in early December 2017, what we cheer is his wondrous commitment to creating beauty: not at top speed, not in a shout, but as if he were whispering tender secrets into our ears. Ted’s birthday party took place at that shrine for music, the Drawing Room (aimed straight at the grail by Michael Kanan and Stephanie Greig) on December 2, 2017. In this video — a touching exploration of THESE FOOLISH THINGS — Ted is lovingly accompanied by Aaron Quinn, guitar; Kris Monson, string bass; Deric Dickens, drums. Also in the course of the evening Jeff Brown took over the drum throne and the gracious organizer of the party — someone we’re all indebted to, tenor saxophonist Brad Linde — played alongside Ted as well. But this one, delicate, curious, and touching, is all Ted’s. You could say that he navigates by the stars of Lester and Lennie, but his internal compass has long ago been his own. And, afterwards, there was cake. Of course! Blessings on Ted Brown, a sweet inspiration. And gratitude that lasts longer than twenty-four hours. Through the kindness of pianist Michael Kanan, I’ve been introduced to the music of people I might not otherwise have met. 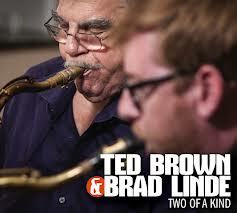 One of them is the soft-spoken and gently lyrical tenor saxophonist Ted Brown. And because of the inventive and much younger saxophonist Brad Linde, there have been celebrations of Ted’s birth: I’ve been at number 85, 88, and the most recent one, Ted’s 89th, on December 3, 2016. The celebrants pictured above are Brad and Ted, Aaron Quinn, guitar; Frank Canino, string bass; Jeff Brown, drums. Other musicians in the house were Stephanie Greig, Nick Lyons, Jon De Lucia, Caroline Davis, and Elijah Shiffer — as well as some whom I haven’t met yet. There was cake (also courtesy of Brad). But more importantly, there was music. Cake is eaten; music lasts. And the approving shade of Lester Young was in the room. Bless Ted Brown and his friends for making such beauty so generously available. Listening to Louis Armstrong, Bobby Hackett is reported as saying, “Do you know how hard it is to make melody come so alive?” I don’t know if Bobby and tenor saxophonist / poet Ted Brown ever encountered each other, but my guess is that Hackett would have said or thought much the same thing. And, somewhere, Lester Young approves. The video below comes from a celebration of Ted’s eighty-fifth birthday party at Michael Kanan’s studio, The Drawing Room, then at 70 Willoughby Street in Brooklyn. (It’s now at #56.) The song, THESE FOOLISH THINGS; the performers, Ted, Ethan Iverson, piano; Putter Smith, string bass; Hyland Harris, drums. Melody reigns here — but softly, with deep feeling, almost in whispers. The heart never needs to shout its truths. On Saturday, December 3, 2016, Ted will be celebrating his eighty-ninth birthday at The Drawing Room from 7-11 with friends including the fine saxophonist Brad Linde; guitarist Aaron Quinn; drummer Jeff Brown, and other surprises. Here is the Facebook event page. This will be special. But please leave me a seat. Posted in "Thanks A Million", Bliss!, Generosities, Ideal Places, Irreplaceable, It's All True, Jazz Titans, Pay Attention!, The Heroes Among Us, The Real Thing, The Things We Love, Wow!